Yesterday errands took us over to the suburb of the famous “Eastern Gate” of Belgrade. The gate is an apartment complex that is a highly visible landmark as cars enter Belgrade on the main E-75 freeway from the east. 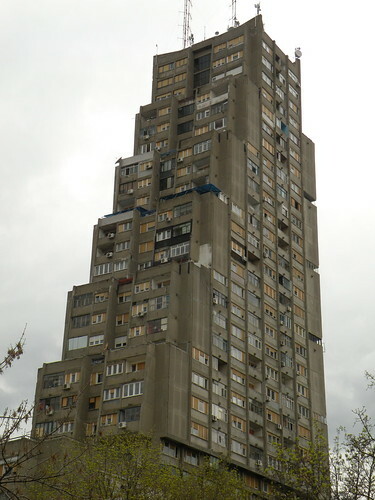 The Genex Building, also on E-75 but on the other side of Belgrade is known as the “Western Gate.” The two communist era “Socialist Realism” architecture style buildings are the most highly visible of a city full of these monsters. I personally love looking at them and have been reading some on their development. The Eastern Gate Apartments were built in 1976 and there are three buildings that form a circle and they house around 2000 people. 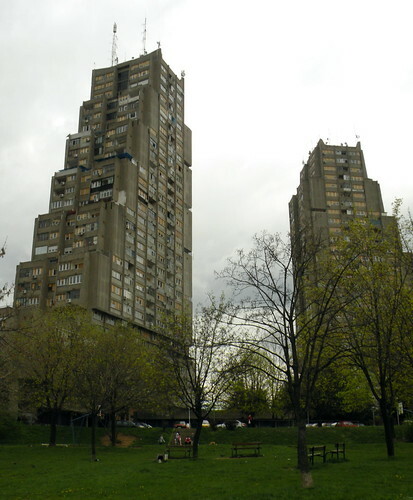 They were built in 1976 and the complex is named after the town of Rudo, Bosnia. The idea behind communist architecture was to glorify the common worker and downplay individualism. They loved cement in those days as it is the main structural and decorative medium. Today’s apartments are made more of brick, wood, glass, and steel. I am so curious to know what it is like to live in them. As I wrote, they are interesting to look at, but I am not sure what the residents think. I would imagine the hallways, stairwells, and elevators must be a disaster because they are not well-maintained. The majority of Belgraders live in apartments, but it seems that they do not devote much resources to communal upkeep of the buildings and grounds. I guess the reason I like this architectural style so much is that it is so different from anything I have ever seen. They remind me of a science fiction movie of a Orwellian future, a type of “Blade Runner” post-apocalypse skyline. I hope I get a chance to go into one. All of my current Serbian friends live in smaller apartment buildings. I’ll be blogging more about these Socialist Realism buildings in future posts.